~~First I want to thank each one of you for the thoughts, prayers, comments and emails. They mean more than you'll know. This has honestly been one of the most emotionally difficult weeks I've experienced. I still feel shell-shocked and numb. We knew Nana was sick, but none of us truly realized how serious it was. She was only 68, and always so full of life. I never really let myself think that we could possibly lose her. 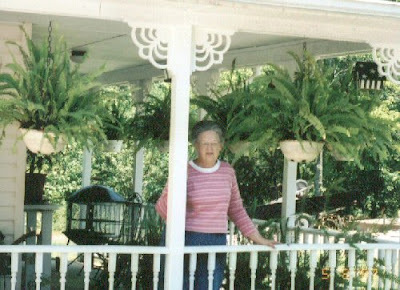 ~~She lived in Alabama but was buried here in Oklahoma, next to my Aunt. They had a viewing there on Sunday evening and then all the family headed this way. For the first time in a long time all 8 Grandkids were together and I know my Nana would have loved that. And yet it was hard because you felt this big hole. She should have been there, right in the middle of us; telling her stories and making us smile. 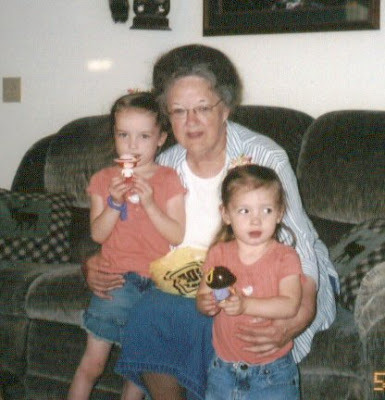 ~~My family has always been very close and Nana was so much a part of my life. Ever since I heard the news Saturday morning, my mind has been flooded with memories. I have many, many memories of her and they're all happy ones. I'm thankful for those memories. ~~Her funeral was Wednesday and the weather was perfect, (a blessing for an Oklahoma March.) The chapel was filled with beautiful flowers. Nana touched so many lives and had many, many friends. It was amazing to see how many people one life can touch. ~~As I stood with my brother, sister and cousins at the graveside, I was struck by the feeling of time going by so fast. We're all grown now, not little kids anymore. I wanted so badly for time to pause, to hold still if just for a moment. ~~My family headed back to Alabama this morning and I've had a hard time wanting to get back into any sort of normal life routine. I still feel the need to pull away from everything else. I'm so sorry if I've owed you an email. Please bear with me. ~~I would like to ask for prayers for my Dad, Aunt, and Papa. I cannot hardly take seeing them hurt so much. My Dad is the strong, quiet type and this week is the first time I remember seeing him cry. It hurts me so much that my stomach has been acting up. It's going to be the most difficult for my Papa. He and Nana celebrated their 50th wedding anniversary last fall. His life just won't be the same without her. ~~God is good and even though His timing is different than ours, I know that He knows best. If anything, I have a deeper desire to reach out to others, to nurture friendships and relationships. Because none of us knows how many days we have left. The close bond I have with each of my family members was a comfort to me and I'm determined to keep it that way, for my Nana's sake. Kasie, I can feel your pain in reading this.. May you take comfort in all the wonderful memories you have with your Nana. She was so full of life..I remember staying with you at her house when we were kids. She was such a sweet person. Thanks for the update, I have been praying for your entire family. I just went through this a couple of years a go with my grandmother and it still hurts, I hate that she won't be here to hear the news about my upcoming baby being delivered. She had six kids and she was always my hero. Thank you for letting us into your life and giving us a brief glimpse of how special she was to you. You will have that with you the rest of your life. Cherish those photos with your girls, they are precious. I can't wait to give you a BIG hug the next time I see you. I'm glad you posted before I left today. I have been wondering how you were doing and how things went. I'm sorry it has been difficult. I can't even imagine how it will be when I lose my grandmother. The issues with her this Fall have only been an inkling of the feelings I will have eventually. What a beautiful gift you were given to have a grandmother like her. What you've shared has touched my heart deeply. I am so glad to hear from you! We are praying for your whole family. Take time for yourself and don't feel guilty about needing that time. You have a great legacy. What a blessing! Take care and know that we are all pulling for you. Kasie, I am so saddened by your pain and will continue to pray for all of your family. What a blessing to have such a special Nana in your life. I hope that you can find some comfort in all of your hapy memories and honour your Nana through maintaining that close bond you share with your family. I once read a passage that said something to the effect of: the best way to honour a loved one who has passed, is to adopt all of their positive traits and practice them on a daily basis. You remain in my prayers Kasie, thank you for sharing these precious, encouraging words with us in the midst of your pain.God is indeed good, and He does so compassionately sustain us! I'm so very sorry for your loss. It's very difficult to say goodbye to a loved one. You're never really ready to let go. May God wrap His arms around you and grant you comfort, strength, and peace. You will always have her living in your heart with many warm memories. I'm so sorry for your loss, Kasie. You were blessed with a very special Nana.